"A few years ago I applied for a job on a wine magazine. 'Tell us about yourself,' said my prospective boss, 'Well, I don't really know very much about wine.' I was offered the job anyway and I've spent almost every day since asking questions about wine. Asking questions is the only way to understand wine - and some of the answers will surprise you, not least that wine is far simpler to understand than you think. Forget the wine snobbery, the "has a bouquet reminiscent of elderberries drying on a nun's bicycle seat" pretentious language that seems to dominate the world of wine. What I offer is an insiders' guide to the real world of wine, the kind of information that a good sommelier will provide you with. Cheers!" Giles Klime. "Secrets of wine" is about the art of free-thinking drinking. Wine over the past twenty or so years has become a massive industry full of spin hype and mega-marketing. Here Giles Kime cuts through the crap, and gives you expert advice on choosing wine that works for you and your friends. 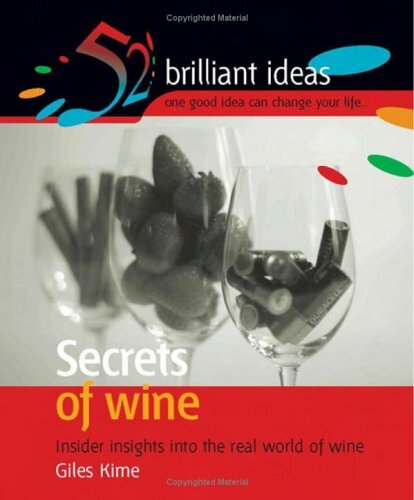 So, if you always go for the Chateau Neuf because it's reassuringly expensive, "Secrets of wine" is for you! Find out how to: Get past the label and the hype; Power-up your palate; Get the best out of tasting and glasses; Distinguish colour and character; Wines that taste of the weather; Discover which foods really go with which wine; Keep wine properly saved and know when to drink it. With the 52 Brilliant Ideas series readers can enhance their existing skills with negligible investment of time or money and will substantially improve their performance over the course of a year. Each of the 52 chapters tackles a single aspect of the subject in an entertaining and lively way. At the end of each chapter is a "how did it go?" feature which allows readers to reflect on the lesson in a classic experimental learning pattern. The tone of each book is personal and informal; readers will feel as though they are having a one-to-one with their favourite coach. From 1992 to 1995 Giles Kimes was editor of Decanter Magazine, one of the world's leading specialist wine titles. From 2001 - 2004 he wrote the wine column for The Sunday Telegraph, for which he now contributes wine recommendations. He has also reviewed wine books for the Times Literary supplement. His day job is Deputy Editor of Homes &amp; Gardens.